Riding horses is undoubtedly a fun activity. There is no better feeling than feeling the wind in your face as you and your horse move on as one! Here are some facts about horse riding in Langkawi. If you love horse riding, then that can be a top reason to visit beautiful Langkawi. It is truly a once in a lifetime experience to ride through mountainous terrains, lush rainforests that lead to mesmeric beaches. If you want to learn more about the local culture you can choose to ride through Langkawi while enjoying its exotic flora and fauna, picturesque landscapes, wildlife, and dense jungles. A good way to begin your horse-riding adventure will be to look into a favourable form of accommodation. Those who opt to stay at a hotel in Langkawi the likes of Berjaya Langkawi Resort will come across breathtaking and challenging riding trails to indulge in a memorable horse-riding experience. If you are a first-time rider or simply inexperienced? No worries! 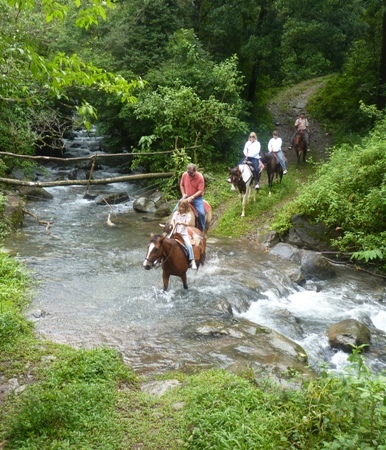 You can enjoy a horseback riding with complete peace of mind since the horse is led by an expert who uses a lead rope. You can choose the jungle or beach for a fun ride because the guide will walk with you all along. This is the most popular ride in Langkawi. Riding through Mount Mat Cincang and going up and down through the forest will enable you to witness different birds and amazing wildlife. Although Langkawi is most famous for backpackers and globe trotters, it is also perfect for that romantic couple get-away. We have a list of five places that you would not want to miss out when you visit. The cable car rides are thrilling as it provides stunning, breath-taking views of the entire island. Once at the top, you should check out the Langkawi sky bridge, which is a curved 410-foot-long platform, suspended at 2300 feet! If you aren’t afraid of heights, then crossing this bridge shouldn’t be an issue! The night markets at Pantai Cenang is most popular because of its convenient location to some of the best Langkawi island resorts. Go around sunset time and enjoy delicious food for a cheaper price. Resorts such as the Berjaya Langkawi resort is just a mere 30-40-minute drive to Pantai Cenang and is a gorgeous place to stay at with rainforest chalets surrounded by lush greenery. Water babies should try out snorkelling at Payar island. The area has been a marine park since 1985 and so the corals are in good condition. A good option would be to sail to the island on a catamaran to enjoy the beautiful ocean view. Langkawi is most famous for this. Travel to the hilly part and take part in many adventure activities such as zip-lining, obstacle courses, ropes, swings and much more. There are special companies that offer safe services for all of these and tickets can be purchased in advance online. Hire a scooter and explore the cobble streets of the island. It’s an incredibly fun experience that you will surely enjoy! Langkawi, although many might be unfamiliar with the name, is considered one of the most beautiful places in the world by those that are aware of the place. Located some thirty kilometres off the coast of Malaysia, Langkawi offers a tropical paradise, with bountiful beauty and many Langkawi resorts to choose from such as the Berjaya Langkawi Resort. Langkawi’s stunning mix of lush rainforests and mountainous landscapes combine to create some truly unforgettable terrain as far as trekking is concerned. The flora and fauna to be glimpsed on the island are also incredibly diverse. When it comes to birds alone, there are more than two hundred species to be discovered on the island. There are also more than four hundred varieties of plant life on the island, with some colossal trees that have been in existence for hundreds of years. One of the best trails is the Langkawi Rainforest Trek which is on the Gunung Raya mountain, Langkawi’s highest peak. The trek can take place in both night and day times. If you wish to glimpse the many animals present in the park, then the day time trek is the best. Ideally you will be able to see giant squirrels, leaf monkeys, and eagles. Night-time creatures also include flying squirrels and flying foxes. There’s also a trek you can undertake through the UNESCO World Heritage Geo-Park of Mount Mat Cincang. The mountain itself is around five-hundred-million years old, and contains most of the species to be seen in the whole of Langkawi, providing an extremely comprehensive experience. These are but two of the trekking locations available for your hiking leisure on Langkawi, and there are many more to choose from, so if you ever find yourself on Langkawi, waste no time and take the island for all it’s worth.